I was researching some information about using blocks with children. I am always impressed by how many skills are reinforced through the use of blocks. Spatial sense, classification, patterning, shapes, cooperation, and planning are just a few of the experiences that children can have with blocks. I am also impressed by how important it is to leave block activities somewhat open-ended. 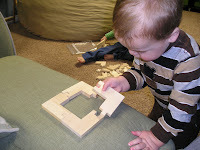 Open creative thinking allows blocks to be a useful tool even an children get older. The kindergarten child creates different things with the same blocks he used as a toddler. It is important to have a variety of blocks available for children. They are also one of the most cost-effective tools and toys a parent or teacher can purchase. We have had an abundance of snow and cold this winter. I think I am over it. I saw some young children making a snowman this morning and I remembered how I used to look forward to snow as a child. When our small town received lots of snow, we were blanketed for a while. 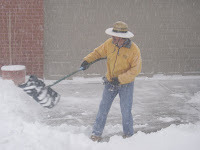 I don't remember any snowplows, etc., so people used to try to clear their own path. I remember being pulled behind my dad's truck on an old car hood taboggan. A very dangerous thing to do (now that I reflect back), but it was a lot of fun. I guess I need to remember my child-like qualities and enjoy the snow while it is here. Hmmmm....I still think I am ready for spring. There was a question comment on my entry of January 3rd about where to find authentic assessments. In my experience, it is critical for the teacher or caregiver to have a roadmap of skills that are appropriate for the age of children she is working with at the time. That is why I wrote the "POCET" program for Discount School Supply. As part of NAEYC's accreditation standards, Standard 4 – Assessment of Child Progress: The program is informed by ongoing systematic, formal, and informal assessment approaches to provide information on children’s learning and development. These assessments occur within the context of reciprocal communications with families and with sensitivity to cultural contexts in which children develop. Assessment results are used to benefit children by informing sound decisions about children, teaching, and program improvement*." It is important to remember that making assessments authentic is the APPROACH we take with the child. When we have a roadmap of appropriate skills and we administer each assessment in a developmentally appropriate way, it is an authentic assessment. As mentioned above, authentic assessment means multiple measures, not just one tool. John Funk has worked in early childhood since 1979. He taught preschool, 1st and 2nd grades and kindergarten. He worked as an early childhood specialist for a large school district and managed early childhood services for Salt Lake CAP Head Start. He is past president of the Utah AEYC. As an early childhood, reading, and literacy consultant for the last decade, he has written on early childhood subjects and products for McGraw Hill and Leap Frog. He served on the editorial panel for Young Children magazine published by NAEYC. Currently, Mr. Funk is the Manager of Educational Programs for Excelligence Learning Corporation, and he teaches university courses in early childhood and supervises student teachers.